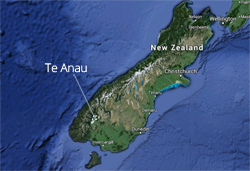 Welcome to our Community News for Te Anau and Manapouri. This page is updated frequently, and aims to give you relevant stories for residents and visitors, in the shortest amount of words, on issues pertinent to our communities and the conservation of this incredible place. We also facebook stories. Another great source of news is the free newspaper the Fiordland Advocate newspaper, available around town and printed on a Thursday. So pick it up and read it! Te Anau Illumination is an event that is held every year to celebrate the date when lights first came on in 1958. People gather near the Ranch and all the lights in Te Anau will be turned off. After the count down the lights are turned back on. The celebration continues at The Distinction Te Anau hotel where there is food, live music and a Fire Show. Read all about it. Fiordland Big 3 is a major hunting festival in Te Anau at the Rugby club. People from all around come to participate. There are three categories that people can win in such as heaviest fish, biggest deer and biggest possum. Read more about the Fiordland Big 3. Freezing cold fundraiser for the year 6 camp to Dunedin. Read about the Polar Plunge. Support the bid for ultra-fast broad band! Emails and letters of support must be sent before the end of June! Find out how to submit your support here. Read this article out today on the news channel Stuff explaining the wonders of walking Fiordland's Hollyford Track. Then read about tramping in Fiordland. Some aerial poisonings are not going ahead in 2014, others are underway and one is imminent. Read the latest in our story here. The first section of a Te Anau to Manapouri cycle trail is expected to be constructed in 2015, reaching as far as Rainbow Reach. Read the story on Stuff, visit the Fiordland Trails facebook page and find out more about cycling around Te Anau. A brilliant report explaining the enormous potential for cycling around Te Anau and Manapouri has been published. Go to the report by Venture Southland. Once again, Te Anau is celebrating the winter by covering its town shops and restaurants in amazing sparkly lights, thanks to the efforts of hundreds of volunteer hours. It's a beautiful place to visit in the dark months, with often bright days - and definitely sparkly evenings. A planned monorail through the heart of a world heritage forest near Te Anau, that would have destroyed thousands of trees, has been rejected at proposal stage by the Government's conservation minister after a campaign by Save Fiordland, a Te-Anau based organisation. A Beethoven festival is happening in Te Anau next weekend! Don't miss it! For bookings and further information, contact Te Anau Lodge 03 249 7477. A community shuttle bus is now available from Te Anau to Invercargill for medical appointments between 10am and 3pm, including hospital appointments, dentists and more. For more information, go to our medical page. 03/11/2013 Redcliff Cafe in top three restaurants in NZ! The Redcliff Cafe is one of only three NZ restaurants to be rated by Trip Advisor in its Travellers' Awards. Find out more about this wonderful restaurant on our Fine Dining page. A biplane regarded as a New Zealand 'national historic treasure' is now based in Te Anau for scenic flights over Fiordland. This historic plane is being offered for flights through Airscapade Affairs, which operates out of Te Anau Lodge. See our Planes page. The University of Otago has been using special cameras to measure the bottle-nosed dolphins in Doubtful Sound and track their parenting techniques. The dolphins were found to be up to a whopping four metres in length. Read more from the Fiordland Marine Guardians. Fiordland College kids have beaten off competition to reach the finals of the Get2Go competition, involving kayaking, biking and orienteering, and are heading to Great Barrier Island for the final stage. Read more in the Fiordland Advocate. The New Zealand Symphony Orchester is coming to Te Anau for an evening of family favourites including Prokofiev's Peter and the Wolf. Find out more about the NZSO. 03/10/2013 Indian takeaways at long last! After the closure a few years ago of an Indian restaurant in Te Anau, a new Indian takeaway, called SolGeo's is opening in the Mobil Petrol Station in the centre of Te Anau. Read more in the Fiordland Advocate. Te Anau kids are to play in smoke free environments thanks to the Te Anau Community Board. Lions park playground and the skatepark will both have signs erected banning smoking. Read more in the Fiordland Advocate.